I'm making a start on Christmas cards and I thought these colours would work very well with what I had in mind. I'm also using up some of last years Christmas Designer papers. The Real Red patterned sheet comes from the pack Santa & Co. and the Smoky sheet comes from the pack All is Calm. Come and have a look. This is a Twisted Easel Card, or an Angled Easel card if you prefer and the stamp set is Called Wonderous Wreath. There are matching framelits available for this set which can be purchased as part of a bundle or sold separately called Wonderful Wreath. I'm so glad this one carried over into our new catalogue. I've done some Justin type staging for my photographs. By the way he is the master of staging, Lol. Here is a side view and the inside of the card. Today I've made a card with some new products, Market Fresh stamp set and Farmers Market Designer paper pack. I've used the Lettuce image with the cute pun and the Lots of Labels framelits. The cardstock chosen is Crumb Cake, Delightful Dijon, Very Vanilla and Old Olive for this card. The stamped image has been coloured with an Aqua brush and several inks including Old Olive, Cucumber Crush, Mossy Meadow and Hello Honey. The imaged was fussy cut and layered onto the Labels with 3D foam. Here's the full pic below. I really like how this turned out. If you have any questions or would like to order these products please don't hesitate to contact me. How is your Sunday? I would love to say I've had a lazy day at home, but that's not the case. I still get to run my daughter to and from work on Sundays, and while I'm out do some groceries. Isn't that fun, Lol!. Today I have a card made with an older stamp set Six Sided Sampler and matching Hexagon punch which I've combined with the Bold Butterfly Thinlits and some in colours. This is my take on the catalogue sample on page 105 of our Annual Catalogue. Come and have a look. The colours I've chosen to work with are Watermelon Wonder, Mint Macaron, Totally Taupe and a base of Sahara Sand cardstock combined with Very Vanilla. I've also used the Gorgeous Grunge stamp set to stamp the background of the card and some older Washi Tape along the lower edge. I think it ties in nicely both colour wise and with the Hexagon pattern. Here's the full pic of my finished card. How is your Saturday and your weekend shaping up? We had a friend of my husband visit so that had them busy in the shed with Mens business for a while, Lol. I just had to feed them. That did give me a bit of time for my craft. Gotta love that. Today's card was made with the Watercolor Wings stamps combined with Butterfly thinlits and Bold Butterfly framelits. The cardstock I've used is Mint Macaron, Whisper White and Vellum. The Whisper white card background has been embossed with the Lovely Lace embossing folder and the greeting comes from the Butterfly basics stamp set punched with the Large Oval punch. Here's the full pic of the finished card. I love that new matching trim as well. 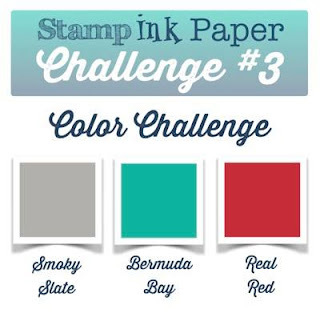 Ink used were Mint Macaron, Lost Lagoon and Bermuda Bay. Today I'm showing another card I've made with the new stamp set You've Got this. I actually love this colour combination. Black and White with Bermuda Bay. The card base is Basic Black and the patterned paper is from last years pack called Back to Black. The stamped image has been heat embossed with Black embossing powder and the background stamped in Bermuda bay then I've used the Lots of Labels new framelits to cut and match the image. See a closeup below. I've added a butterfly stamped with the Papillon Potpourri stamp set and the greeting comes from the set called A dozen Thoughts. This card was made based on the sketch this week at Stamp Ink Paper. It's one of the Design Teams I'm part of. I hope you've enjoyed seeing today's card and you'll leave me a comment to let me know you've visited. Have a great day. I have had another busy day today and also tonight, to & fro from school and back with my girls in school and Awards ceremony at school for the Year 11's tonight for their Australian Business week presentations. Yes its been busy leading up to the end of term. This will finish the term for my eldest tonight, and tomorrow is the last day for my youngest. I did manage to finish off this card before we have to head back to the school. This card uses a combination of the Watercolor Wings stamps with the matching Bold butterfly framelits and Awesomely Artistic stamps to create this awesome (I think) monochromatic card. The base is Lost Lagoon cardstock combined with Whisper White and Vellum. 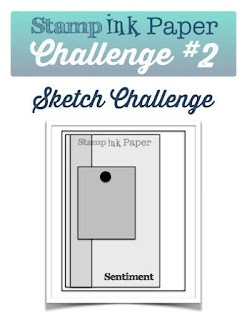 Welcome to another Wednesday card sketch ch allenge at the Paper Craft Crew. Here is this week's sketch. I've decided its time for me to start Christmas card creations, so that's what I've chosen to do today. I've used the Stamp Set Ornamental Pine which was a brand new one for me that I didn't get around to inking last Christmas and unfortunately it has retired and did not carry over for this year. I always admired the cards I'd seen done with it. I chose to combine it with Cardstock of Early Espresso and Very Vanilla with dsp from last year's Christmas specialty pack called All is Calm. The inks used were Mossy Meadow, Early Espresso and Real Red. I really like how this turned out even though there was quite a bit of fussy cutting involved here. The Pinecones and Bauble where all cut and are raised on 3D foam. I also added some retired Early Espresso ribbon from my stash. How was your weekend? Mine was jam packed starting with a late night on Friday night for the Basketball finals at Noosa Leisure Centre and continuing on with lots of running around. Mum's taxi was very busy. First of all I must tell you about the Basketball results from the weekend which I forgot to share yesterday. My daughter plays in two teams and was runner up in both. She has too silver medals from the comp, U16's and U18's. The Under 16s was a very close nail biting game 31 - 28 and it went right down to the last 40 seconds of the final quarter. The second game was not so close, but thats life. Pictures of medals below. Onto today's card. I've used Awesomely Artistic for this card using a Crumb Cake base. Come and have a closer look. How is your weekending going. Mine is almost over. It's after 9pm on Sunday night as I type this and we've had a busy day here. Its the last week of the school term here starting tomorrow and there are multiple projects going on at school. We had to shop for clothing & shoes for the eldest for Australian Business week at school. That took up the afternoon. I have just finished my card after just helping my youngest daughter colour her hair. Will be interesting to see the result when she's finished. Onto the card which I've made combined Watercolor Wings with the Bold Butterfly framelits and a background stamp from the Mini catalogue which finished at the start of this month called Something Lacy. Come and have a look. The cardstock used is Crumb Cake, Whisper White and Bermuda Bay. The Inks used are Delightful Dijon, Pool Party and Bermuda Bay. Here's the full pic. I've been to a friend & fellow demonstrator Gaye Schrader's new catalogue launch today to support her and I'm showing the Make & Takes I made with her. These are Gaye's designs and I was very happy to sit back and enjoy the afternoon with the other ladies there. Come and have a look at what we made. Mine were made from Cucumber Crush (new in colour) card combined with Whisper White and Basic Black, and I'm glad because its not a colour I would normaly gravitate to or be my first choice, so its great to have some samples in this colour to show my girls. Here's the first one we made using the stamp set You've Got this. 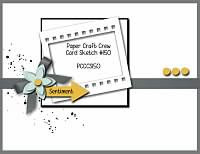 The ink used on the background was Smoky Slate with the Cucumber Crush Flower stamped over the top and the matching ribbon tied around the panel. I hope you are having a fantastic Friday. I am posting early because of the Basketball finals tonight. My youngest is playing in two finals in her first season of basketball. Its very exciting for the first team particularly, the U16's because they are the Noosa High School team. I'll be there cheering and let u know the results in my next post. Here's the details on today's card using one of my favourite Butterfly thinlits over the new stamp set Watercolor Wings. The cardstock used is Blackberry Bliss, Whisper White and Brushed gold. The Patterned paper comes from the Moonlight paper stack and I've added some Hello Honey ribbon. The greeting used comes from the Butterfly Basics stamp set. This was a quick card, but those layered butterflies always add a touch of wow factor. Love how they look like they just landed there with the dimension the wings add. Thanks for stopping by today. Have a great Friday. I am loving playing with this new Designer paper I've bought from the new catalogue called Timeless Elegance. I think it's going to be so versatile for many occasions. I've used it to make a "Thinking of You" card today. Come and have a look. The cardstock I've used is Basic Black for the base, Tip Top Taupe for the trim and Very Vanilla for the greeting. I used the Papillon Potpourri stamp set for this Butterfly which was heat embossed on Vellum with Blushing Bride embossing powdere and the greeting cut with the Bitty Banners framelits is from the Teeny Tiny sentiments stamp set. The dotted ribbon border punch was used under the bottom edge of the banner and the butterfly sits of a shape cut with the Lots of Labels framelits. Here is the full pic of the card. Thanks so much for stopping by. I hope you have a great day.